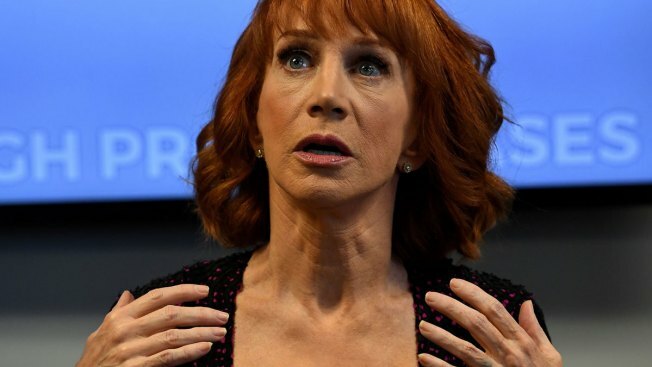 In this file photo from June 2, 2017, comedian Kathy Griffin gestures during a news conference to discuss the comedian's "motivation" behind a photo of her holding what appeared to be a prop depicting President Donald Trump's bloodied, severed head. Kathy Griffin says she is in the middle of a "Hollywood blacklist" after taking a photo holding a fake severed head that resembled President Donald Trump. The comedian is currently on a world standup tour. She says in a YouTube video that when she returns to the U.S. she doesn't have "one single day of paid work" scheduled. She says she doesn't want to do free shows or work small clubs and thinks she should be able to get her life back. Griffin says the Trump photo "offended a lot of people," but added: "this wall of crap has never fallen on any woman in the history of America like it has on me." Griffin initially apologized for the photo published in May before saying she was no longer sorry over the summer.